Don’t be a Digital Caveman! 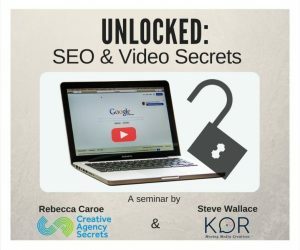 After the success of our last SEO event, Creative Agency Secrets has teamed with KOR Creative to bring you Unlocked: SEO and Video Secrets! With more customers reaching for businesses that utilise digital channels, it pays to invest in a good online strategy. SEO can help your website gain more traffic and leads, whilst video provides a visual appeal. Video and Search Engine Optimisation (SEO) are two key elements to increase your search engine ranking. 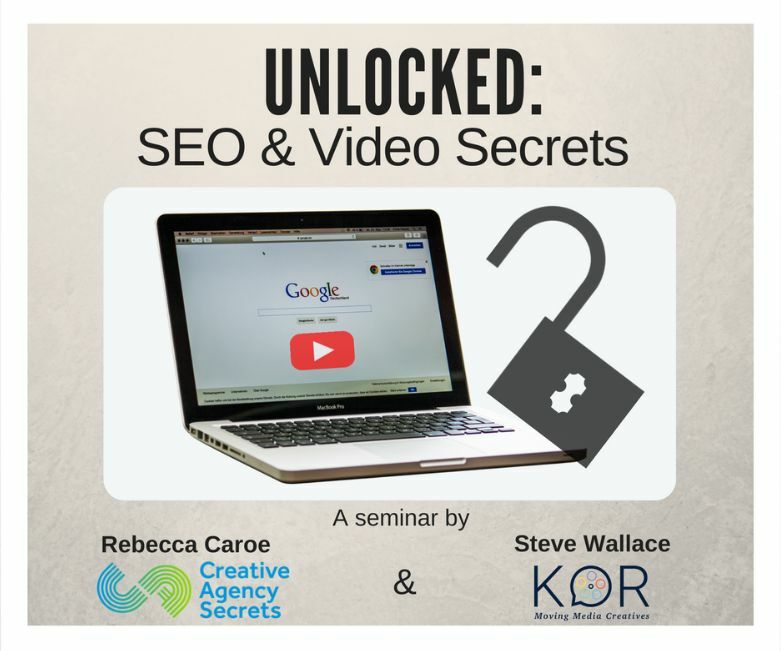 Rebecca Caroe and Steve Wallace have prepared a breakfast seminar where you can learn how to attract quality traffic to your website, through SEO and Video. For one of our clients, we helped to boost their website from the second page of Google search to the second link on the first page! Click here to see how SEO helped Baucher Consulting get to the top of the search list! You will also have the opportunity to network with local business owners while feasting on a breakfast of your choice at this exclusive CAS and KOR event! There are a limited amount of seats, so be sure to get in quick. Enter the code BIZDOJO2017 for a 50% discount at the checkout! 1 – Creating excellent content about your event speaker(s). This should be original so ask for an interview and video them as they talk to you. 5 – Follow the presenter’s personal blog / websites. This is so you can do curated content. 6 – Every Friday send an email to your mailing list with a link to the video you published that week. Also include links to the other articles written by the speaker(s) from your list in 5 above. 7 – Encourage readers to add comments to the videos as you share them. What questions does this raise for you? How would you solve this? Does this match with your experience? 10 – As the event gets closer, add in more publicity for the speakers on the theme of the event itself – you can do this by asking the speaking team to allow you to interview them by Hangout or Skype video chat. Your interview should be 3 questions only. 11 – Get your video edited down to 90 seconds as in 2 above. 13 – Share on social, add to the newsletter, encourage people to comment or ask questions. Ask the speakers to also share the video onto their website and social channels. 14 – Continue weekly until you release the tickets for the event. By this time you should have a good mailing list of prospects and this will help early bird ticket sales. The Webstock conference in Wellington each February is a very good example o this methodology – join their mailing list to see how it can be done. Note their newsletter also shares jobs and event listings which is a very nice way to enable them to stay relevant in the year between conferences. Go rock your event… and don’t forget to video it and release the video afterwards so the people who didn’t come realise what they missed! All businesses face competition with their sales but also in how effective and efficient they are, too. And that’s where automation enters the picture – to be competitive you need to use automation, otherwise, someone else will be automating you out of your business. Every business, no matter how small, needs to use innovative automation strategies to accommodate a growth in sales while also controlling their costs. When you start to automate processes in your business, choose ones where there’s no human value-add to start with. This will save you time in execution while also avoiding any human errors. Again, this sounds more relevant for big companies but small businesses need to make sure their staff members are on board too. Employees can be reluctant to adopt automation because they’re worried that this automation will cost them their job. However, in the majority of businesses, automation is at the heart of every success. Ultimately, automation may affect their current job but it will enhance their next job. When discussing automation with your staff members, talk about how they’ll benefit from it. Discuss current functions and how it will allow them to progress into positions that are at a higher level than they are at present. Equally, by automating the easiest processes first, it’ll allow you to demonstrate the benefits without making any dramatic changes right at the start. Look at a function within your business that has a good return on investment. Then pick another function once this one has been successfully automated. This will allow you to show your employees how successful automation can be, and may even result in them asking you if you can automate other specific functions. Now, you won’t have to gently encourage your employees because they’ll be encouraging you to make changes they’ve identified themselves. When you start to implement automation, you’ll define the process at first before codifying it and automating it. After a while, this process will start to naturally collapse. As you start to get involved in automation, you’ll probably find that you have a few “experts” within your company. You might also have a few other employees who are deemed experts but are on the periphery of becoming so. At this point, you might find it beneficial to establish your own “automation service bureau” whereby you have your own in-house team that is focusing solely on automation. In the long run, these positions will generate further revenue for your company, making these roles more than worth it. As you start to automate your processes, make sure you’re documenting them as you go. Document where you started from, what was spent on automating the process and what results you have seen. Do this for every project so you don’t start to take anything for granted. Having these case files will show you how far you’ve come and will motivate you to automate even more processes as your company progresses. If you can, try to find an automation expert from within your industry and get them involved in your company’s initiative. These experts will have the ability to see where your business can be in the next few years, understanding exactly what changes are required. They know how to start off with small processes (like you have) before turning them into big, groundbreaking changes. You may also reach the point where you need to take on a vendor. If you do, make sure you’re choosing this partner based on whether they have the right level of technology, innovation, and scope. You should also make sure they are going to be able to grow along with your business too. Consider where you’d like your business to be in the next three, five or ten years. Ensure this vendor will be able to support the economics that is working for your business and will be able to help you achieve your vision. Jordan Ross writes articles for a variety of business blogs on a variety of business topics. 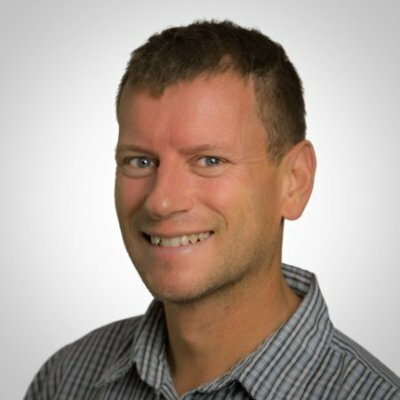 He has a ton of experience he’s able to share with readers thanks to his years of business experience running his own companies. There will always be debate when it comes to marketing a business using digital and traditional marketing methods, and while there are no right or wrong ways when it comes to marketing a business, you’ll find a lot of business owners prefer one of the routes rather than both. Some marketers prefer traditional marketing because their target audience is local, whereas others prefer digital marketing because they’re trying to target an audience on a global scale. However, both techniques are a lot more similar than people think and here are a few points that would suggest this. The great benefit of both techniques is that while the cost in marketing can vary a lot depending on the methods used, both techniques still offer free or very affordable marketing strategies. Take digital marketing, for example, where there are no costs involved when it comes to social media marketing unless a business wants to take advantage of one of the advertising platforms available. The same also goes for a traditional marketing method such as leaflet distribution – leaflets cost very little to print and paying someone to distribute them is affordable. If you’re looking to market a business but you’re unsure of what route to take, consider obtaining a master in marketing online using an online MSM program, as that will give you the knowledge you need to take your business forward. With the help of social media platforms, it’s now very easy to get insight on demographics so you can target a specific age range or country, which makes digital marketing very easy. The same goes for traditional marketing methods such as leaflet distribution – you can easily target family homes or specific age ranges thanks to local/online records and user statistics. 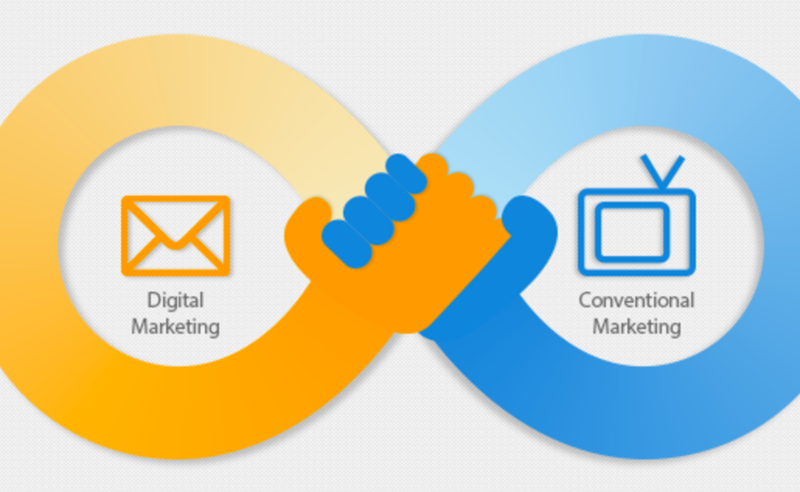 Whether you opt for the traditional marketing route, digital marketing, or even both, you can be sure that both techniques offer a brilliant chance of success if the correct marketing strategies are deployed. 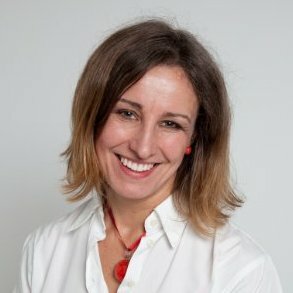 There is no higher chance of success rate for either technique as each offers different prospects depending on the type of business and audience you’re targeting – so taking advantage of both techniques could prove to be successful. The benefit of both marketing techniques is that they can be used together. If your business is new, you can always opt for a digital marketing strategy using social media to keep costs at a minimum, but there’s nothing wrong with using both techniques together as your business starts to grow. Most businesses will advertise locally using postcards and leaflets, but then they will also start a social media marketing campaign around the same time to get more exposure. Both marketing techniques offer a variety of benefits depending on the business that implements them. However, even though they are completely different techniques in terms of the work involved in marketing, the above suggests that they are, in fact, quite similar after all. A client who runs a retail business is in need of expert support for their WordPress website. WordPress Developer with Woo Commerce experience. In summary – if you are a business who can provide this support, please reply with a brief summary of your business expertise to Rebecca Caroe. We will pass your details to the client who will be interviewing immediately. NOTE: One-Man-Bands need not apply. Working with a client who makes animated explainer videos – Case Study of how to grow referrals. We discuss three ways they can get more referral business. Every market changes over time – fads pass, new ideas surface. So write about what’s happening in your market. Consider writing about styles, techniques, innovations to be added onto an explainer video (if that’s your business). So which new styles are coming about? Where did each one come from – background and timeline of the evolution. In the writing analyse the change, what are the component parts, which elements stand out. You could add in new uses for explainer videos – for example in a PitchPack video brochure. You need to speak to people if you sell in Business to Business (B2B). The best way to start a dialogue is with Open Questions. These encourage a longer response from the other person and give you insight into their views on a topic. Any insight enables you to position your services as a solution to issues they raise. Here’s an example of a call prompt (not really a script). Can you imagine how the call will develop into a discussion? Possibly opening new opportunities for new business. Create this call list from a list of all your clients from the past 3 years (more if you’ve been in business longer). Also add to the list from your Linked In connections and those from your co-workers. Goal to have 100 people on the list to call. Start to build a referral marketing engine into your daily project work as well. We find what works best is to connect with them early in the project. Start with a “Happy call” when you ring asking for feedback on how the job is going. Then build on this with a similar call just after the project has been delivered. Remind them of what they said on the earlier call. This is the moment to ask for a testimonial for the project team. Do you know anyone else who might like to meet us? My goal is to get two names of people as an introduction. My big tip to make this successful is to ask the question and then to stay silent until the other person has come up with a name…. stay silent as they “ummm” and say “maybe”, “well”, “I’m not sure” and still stay silent and they will 80% of the time come up with a name. If they firmly say no, you can prompt with – maybe a co-worker in a different team or maybe someone from your previous job and see if that can deliver a name. How to use the introduction….. write an email to BOTH people. This is my template email that works. Our AGENCY NAME has just completed a job for INTRODUCER and s/he suggested you as someone who might like to get to know us. We completed an explainer video (link) for INTRODUCER. I took a look at your website and [something helpful here which they can use immediately]. Lots of love from Rebecca (only joking… use an appropriate sign off). I always cc the introducer in this message so they know what I said. In the email you could tell them about the customer satisfaction scores or Net Promoter Score which your team has acquired over time. Or link to TrustPilot Reviews or your Google My Business Review score. The follow up call is just a friendly get to know you call. No selling. But if you feel it’s gone well you can follow up with an email linking to a helpful resource from your website. Here’s one I use frequently. By the way, I found your website copyright is out of date (2012), here’s an article we wrote which explains how to add code to your website so this updates automatically every 1st January. Just send this link to your web developers and tell them to make the change – do it once, and it’ll run forever. This is an example of the type of helpful marketing tips which Creative Agency Secrets writes in our newsletter and blog. We want to enable you to buy web services as an informed consumer (and we don’t build websites, we help our clients to use them actively to win new client business). Then you have to put them onto a stay-in-touch programme or ask if they will allow you to stay in touch with a newsletter subscription. Either way, one call won’t win you business but a dedicated process to provide utility (usefulness) to them, will ensure you are remembered and they take your calls in future. Online reviews are a cornerstone of how consumers make decisions whether to buy a product or not. 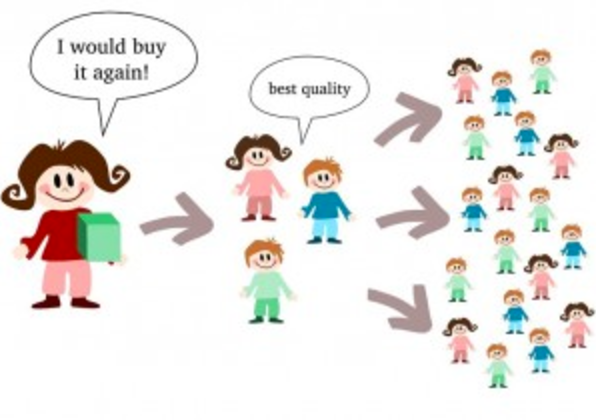 If you see a product that you want, you will read through the reviews to make sure that you are going to be getting what you need from the product. If the product website does not have reviews, the odds are good that you are searching online for one that does have them. But what if you are the business that is getting reviewed? There is a certain level of expectation that you are not going to have 100% positive reviews, right? Here we discuss some ways that you can handle negative reviews online. It does not matter if the review was posted on a very well-known site or one that you might have never heard of, people will find it online. That means you have to take all of them seriously and get a plan in order so that you can defend your business against them. The first time that you see a negative online review about your business you are probably wishing that you had an online public relations degree. Build a plan and stick to it and then reviews will eventually get taken care of on all the sites they are posted to. Depending on the review site where you found the negative review, you might be able to contact them about it. Take a minute and search through the site to see if you can find contact information relevant to your review and how to handle it properly. If you think the review was added by a competitor, you may have a leg to stand on to get it removed, but the process will have to be fool proof. If the website that you find the negative reviews on allows you to respond to them, take a minute and do just that. Being able to explain the situation to them and possibly clear up the reasons they left the review is the first step to repairing your reputation. There is not really any need to hire a public relations expert for this, but an intern working towards an online masters in public relations might not be a bad place to start looking for help. In many cases, and to keep things fair, you might find that negative reviews are not going to disappear from the internet. If that is the case, you can combat them by asking your future customers to leave positive reviews if they are satisfied with your business. There is nothing wrong with asking for some help if they are truly happy with your services. Over time, this will push the negative reviews and bring your overall average rating up, helping your business. Take a minute to take a look at your business and if there is anything that might cause a negative review. There could be a few easy fixes that you can do to keep the negative reviews to a minimum. Good luck!